Martyn Ware founded 1980s British pop icons The Human League, Heaven 17 and the British Electric Foundation (BEF). 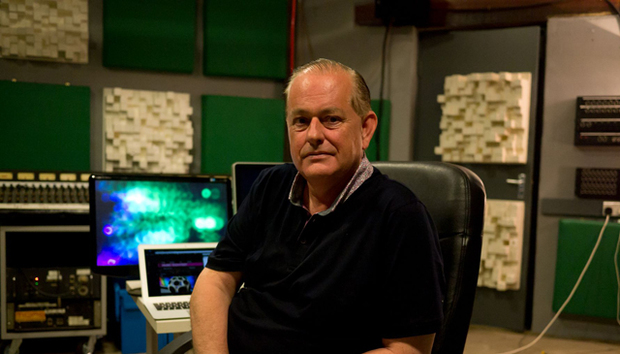 As a producer he has worked with acts such as Tina Turner, Erasure and Boy George and now works with former Depeche Mode and Yazoo musician Vince Clarke at Illustrious Company, producing 3D soundscapes and sound art installations, while Heaven 17 return to the studio to record their first album in six years. A love of technology and art has shaped his career but he has worked in an industry that has been massively disrupted by the arrival of the internet. We caught up in London’s Groucho Club. Q. In July, music streaming stats will for the first time be used in the UK’s Official Charts. Is this the final nail in the traditional music industry’s coffin? MW: Yes I suppose, if not dead it is nearly dead but the music industry will continue because it’s full of optimists. Watching The Brits is a bit like Nero fiddling while Rome burns; it makes no sense living it up on borrowed time. You can’t make money out of recorded music now unless you are in the top tenth of a per cent. I’m on the board of The Featured Artists Coalition and looking at artist rights and new deal structures. The new record company model is the 360 deal where they take a cut of everything – live gigs, merchandise, PRS, streaming, the lot. Why bother? Marketing clout. Q: But doesn’t technology level the playing field, make the process more democratic? MW: You still need to market yourself. The principles are the same, it’s just the medium has changed. With Heaven 17 we are thinking of releasing our next album on vinyl only with a download code. I don’t see any value in us releasing through traditional distribution because everyone is nibbling away taking percentages all the way down the chain. We end up with nothing. Is the process more democratic now? Not really. Social media marketing companies are just doing what the record companies did before. It all comes down to marketing still, whether it’s using TV shows or clever viral videos shared on Facebook. This could change again though as I heard that the BPI may include “Shazam-ed” music [based on the number of times users have used a music recognition service to identify a track or artist] in the charts. The more outlets that have an influence on the chart, the more it could actually be an accurate representation of what is popular. Q: Is there an upside? MW: More live music is one. Music tools are also more easily accessible. Anyone can put together a song on an iPhone for example and upload it to the internet. Is it any good? Probably not but then you are faced with the question: how do people know it exists? This is where the problems start. How do you direct traffic? That said, technology is helping to connect music in remote locations through mobile, particularly in developing regions. I am off to Zimbabwe with Un-Convention later this year. Organiser Ruth Daniel works with poor communities around the world educating and helping to equip them with technology to make and share music. It will be interesting to see how they use the tools, what they can produce. I guess it’s the emancipation of the means of production — which is Marxism, isn’t it? Q: How important has technology been in your career to date? MW: My career would not have existed without technology. It started with a [miniature pen-operated keyboard] Stylophone, believe it or not. I even had a dual-stylus Stylophone which are very hard to get hold of now. My partner in crime Ian [Ian Craig Marsh who also played for Human League and H17] built his first synth from a [UK electronics retailer] Maplin kit. We were always messing around with early technology and the rise of the Human League coincided with the arrival of the first entry-level synths, such as the Korg 700, which was my first synth – about £350, which we bought on hire purchase because we had no money. Then Ian bought a System 100 Modular synth and we were hooked. Q: Did technology change music or just add a new dimension? MW: We were at the start of MIDI. There were no presets on what we did. It was also the start of mobile audio. The Sony Walkman came out although it was originally called the Stowaway. We actually did an album called Music for Stowaways. We loved the idea of people being able to carry their own personal soundtracks around with them. Suddenly, music consumption was changing. At the time we were recording on a Sony two-track tape recorder. We didn’t have a mixing desk, we didn’t have multitrack, we didn’t have anything at this point but that’s when we made Being Boiled in 1978. We were heavily influenced by Brian Eno who said in an article at the time that all you need is Revox to be in a band and so that’s what we did. Technology made it easier to create new sounds. Today it speeds up workflow: you can work more intuitively, but back then it was revolutionary. Q: Talking of revolution, what was it like being banned? Did you laugh when Radio 1 DJ Mike Read refused to play (We Don’t Need This) Fascist Groove Thang? MW: No not at all, it was very serious for us. The record company, Virgin Records were on board; everyone was on board with the song. They were brave to back what was probably one of the first overtly political pop songs in the UK but one of the key tools of Virgin’s trade was to get Radio 1 on board with its songs and artists. If you couldn’t get onto the Radio 1 playlist it wouldn’t stand a chance of being a hit. We ended up re-writing some lyrics and recording it but the damage was already done. It was an interesting period though and other songs were being banned for various reasons but it was definitely a politically delicate time. Bands such as The Specials were coming out with Ghost Town, which is still a great record. Q: Education, technology and creativity? Discuss. MW: The arts are regarded as an inspiration for technology design but then they tend to be shelved. It’s crazy to disregard the arts as an irrelevant sidebar to technology. It’s in the DNA. You can’t have one without the other and education should reflect that. Q: What was your creative process? MW: We used to jam, essentially, until we found something inspirational. It was like being mad professors in charge of the synths – the Roland System 100 and the Korg 700 – neither of which were MIDI. When we found snippets we liked we would vaguely construct something. We were less obsessed with making conventional pop songs, although we did want to appeal to people in a quasi pop-like manner. The constituent parts were not conventional and this is evidenced in the first two Human League albums but I’m still incredibly proud of what we achieved. Q: Has this process changed over the years or do you still approach everything as if you are writing a song? MW: We have always loved the songwriting craft and it’s much underestimated. Everything we do now is modulated through a desire to appeal to the public, whether it’s new Heaven 17 material or immersive 3D soundscapes. In that sense, we haven’t changed much. We still have a populist attitude but we have always worked with weird ingredients — a bit like Heston Blumenthal, although I am not a fan. Q: Does the technology you use then influence the creative process? MW: Yes, I think it does. I was working in this purely synthetic world creating sounds from scratch in a modular fashion and in many ways this became the building blocks for how we created our music. Q: How did your soundscape work come about? MW: In the late Nineties I was doing more and more stuff with Vince [Clarke] and we got a chance to work on a 3D sound auditorium for the National Centre for Popular Music. There was nothing for musicians at the time so we came up with 3D AudioScape, a combined hardware and software system to create 3D sound. It’s changed a lot since then but that’s where it started. Q: What’s your favourite 3D soundscape? MW: The breathing tree was nice and simple but my favourite… there are a few. I am fond of the work we did with the artist Cathy de Monchaux which was composed of calls to prayer from around the world, layered together with recordings of Cathy reading extracts from her private diaries. It was beautiful. I also loved Tales from the Bridge, the piece we did for the London 2012 Festival of London. Q: Can soundscapes affect moods in open places even workspaces? MW: They can do. We did a project in Brighton called Sounding Brighton. It was about reading the crowd as a DJ does and reacting with ambient, immersive music to try and manipulate moods. It worked. There was no trouble that night. It’s been well studied by academics and analysts. We are hoping it will kick-start positive soundscaping in urban environments. MW: Since we did the Millennium Bridge we seemed to get promoted to the Premiership [English football’s top division] as bigger projects are now coming our way. It’s exciting. We have a lot of great projects coming along, in shopping malls, potentially the Olympic Park, Liverpool docks and so on. I am also doing something with the artist Zarina Bhimji, plus doing something for the Brazil Olympics on fan sites. Loads of futuristic stuff. Q: Talking of the future, would you ever use wearable computing devices such as Google Glass? MW: Google Glass, I’m not so sure about but when I used to do the Future of Sound shows, there was an artist called Di Mainstone who came up with wearable modular interactive costumes that would clamp together magnetically. The idea evolved into The Human Harp, where her wearable technology created resonance with the Brooklyn Bridge, enabling her to play the bridge as if it was a harp. Would I wear it? Probably not, but you can see how mood sensors and health-related devices could become popular, as long as you couldn’t see them. Most people don’t want to look like idiots. It’s not like a science-fiction novel. It will be much more banal.